Kirstiekins Blogs: Apple store selfies! I know I haven't posted much in the past week, but I have a legitimate excuse for that okay! It's coursework season, so I kinda have to do that, or there is no point in me actually going to university is there? Anyway, to make up for my brief hiatus here is a picture of me in the apple store! I have been waiting 45 minutes for them to come and sort out my earphones, and I am now getting super sad about this. Cry! So tadaaaa!! 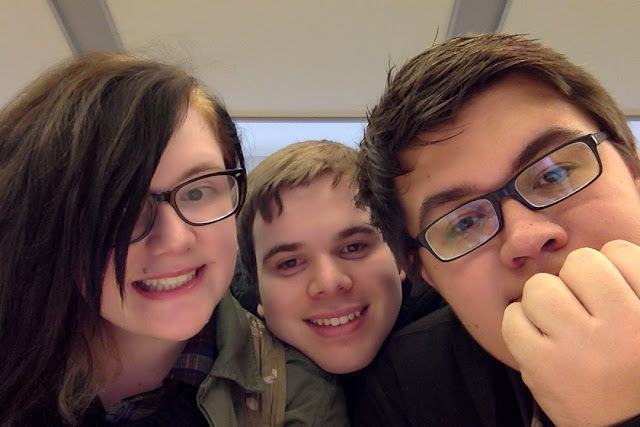 This is me, Daniel and Robert in the Apple Store! Daniel doesn't blog, but Robert does, and you can find him here! Check back soon for cool Christmas stuff, and more app store fun!